This new garden along Polk Hall is designed to manage stormwater runoff from the Brickyard. Come July, the Brickyard will be more ready than ever for a rainy day. NC State’s Facilities Division is constructing five sustainable landscape improvements that will reduce flooding on and around the university’s popular plaza. 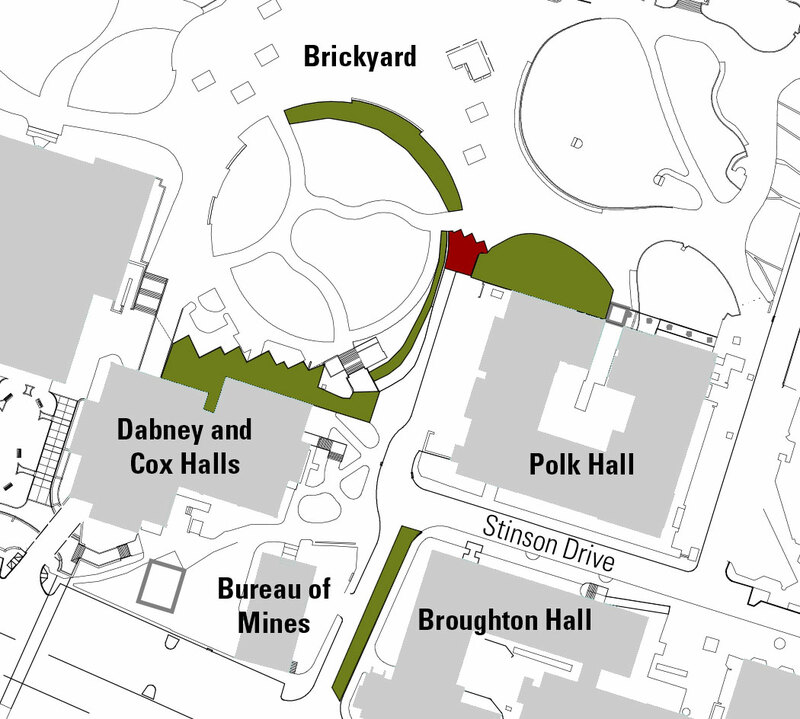 A combination of rain gardens, permeable pavers and other green infrastructure will reduce stress on the Brickyard’s decades-old stormwater infrastructure, preventing runoff from reaching nearby buildings such as Dabney Hall, Cox Hall and Bureau of Mines. “The idea is to slow the water down and take the pressure off the existing campus stormwater system,” said Dave Josephus, an NC State landscape architect. 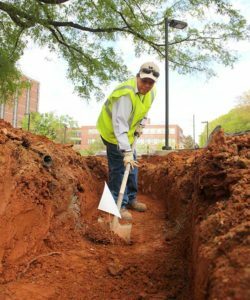 Much of the underground drainage system serving the Brickyard was installed more than 50 years ago ‒ long before development surged on campus and along Hillsborough Street. The increased number of parking lots, rooftops and other impervious surfaces leaves less natural landscape to absorb rainfall, resulting in more runoff. Installing new underground drainage is invasive and expensive, so last fall Facilities employees began exploring alternative solutions to managing stormwater. They studied rain flow and existing drainage patterns before creating a design that balances the historic vision of Brickyard designer Richard Bell with today’s sustainability best practices. The design calls for five projects, including green infrastructure and gardens (shown in green) and a permeable paver system (shown in red). Facilities chose to utilize low impact development, which has been successfully implemented in other parts of campus. With this approach, the university works with nature to provide a restorative ecosystem that reduces flooding and erosion while also improving water quality. 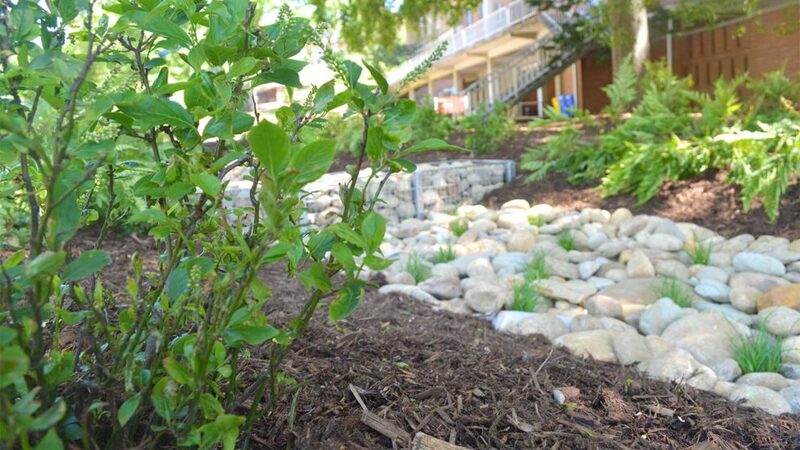 These low-maintenance techniques slow, capture, cool and clean stormwater at the source. Along the former site of Harrelson Hall, two new rain gardens will absorb stormwater and filter sediment. Additionally, each garden includes an infiltration well to collect water that will gradually absorb into surrounding soil. To make way for construction of the gardens, Facilities removed most of the existing landscape, saving nearly all the plants for future replanting. On the northside of Polk Hall, another large rain garden will capture and slow water. To address runoff that bypasses these gardens, Facilities is replacing 1,600 square feet of the Brickyard with a permeable paver system. “The permeable pavers will be laid in the same pattern as the rest of the Brickyard but the system has a 15-inch stone base. The stone base will have a uniform slope and allow for stormwater storage and infiltration into the soil below the pavers,” said Lynn Swank, the NC State project manager coordinating the stormwater improvements. The paver system will be evaluated over the summer to ensure effectiveness and durability. If successful, the system may expand throughout the Brickyard. Further downhill along the ground-level entrance to Dabney and Cox Halls, a brick pathway will be graded to slope away from the buildings into rain gardens that can slow and absorb runoff. Lastly, stormwater flowing down Stinson Drive will be redirected into a new bioretention garden along the western side of Broughton Hall. The garden’s biosoils and plants can absorb the first inch of rainfall while an underground pipe transfers additional runoff to existing drainage systems. Landscape Construction Services employee Antonio Vazquez Hernandez preps a new rain garden at Polk Hall. Along the Brickyard’s southern perimeter, runoff has long been a challenge that worsened after the removal of Harrelson Hall last year. “When you remove a building that massive, the hydrology [of the area] changes,” said Rick Hilburn of NC State’s Landscape Construction Services. Facilities expects the combined impact of these five projects, which will be completed in June, to successfully prevent future flooding in a sustainable way. Published in Land, News, Newswire, Uncategorized, Water.